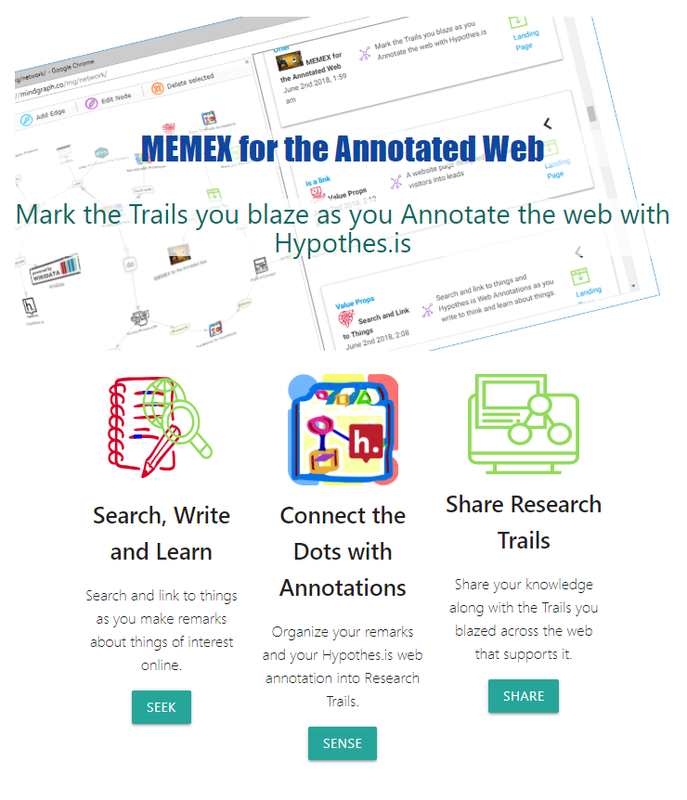 Blaze trails with @TrailMarks as you search and annotate the web using @hypothes_is. Link annotations to your narrative trails as you “connect the dots”. Share them along with the “entire scaffolding by which they were erected” as a HyperMaps. Inspired by Doug Engelbart’s “Dynamic Knowledge Repository” concept. High Resolution Recall of structured HyperMedia it creates in a private, offline first, personal setting. It is built as the simplest possible thing that could possible work that would augment individuals ability to understand and be understood. When a specific Hypothesis annotation is dropped into the ‘Linked Text Editor’ a “dot” is created for it that is linked to the “dot” presenting the page within TrailMarks. The dot for the annotation thereby gets linked to relevant context within TrailMarks, and that become discover-able in all relevant contexts. In effect annotation gets organised in meaningful ways. TrailMarks can publish posts to WordPress with the support of Liquid | jrnl that enables required capability to be loaded to interpret the post produced by TrailMarks as a graph and add dynamic capabilities to the WordPress post, things like popup cards, HyperMap visualizations and links back tor TrailMarks. WordPress posts by TrailMarks are constructed in such a way that the graph from which they were generated from can be made available to Liquid | Space to be incorporated into Liquid | Space contexts. Several links in this post are broken/404. Thank you Stephan for your observation. Apologies for not even including a warning about the inoperable links. At the least I added that now, and hopefully could remedy the missing links soon.